I have been so busy with my own projects, it’s time to find some gems that others have. My table is often dominated by a dry erase board or mat in the middle of the table. I dance in and out of players approximating maps and pretend it doesn’t interrupt play. even if you don’t use minis, the drawing of the map has become, and has been one of the struggles of tabletop RPGs. I have toyed with some alternatives, such as using photoshop with various masked layers to pull back as the party progresses and other techno-work arounds. For the sake of expediting, I usually fall back to the dry erase solution. What about Virtual Table Top? Virtual Tabletop gives me a giant nerd-on and it has a working solution, and a rather full featured one with fog of war, icons on the map, facings, rules and many other things…. I don’t really want to figure out. Virtual Table top is player centered. Each turn looking to the player to move an icon, take actions, facing… every turn, you are going to the interface. Enter Battlemap Explorer by Byron Knoll. Byron is attempting to build a site in his off-time that will allow users to upload their maps as image files, and allow you to define walls and doors. 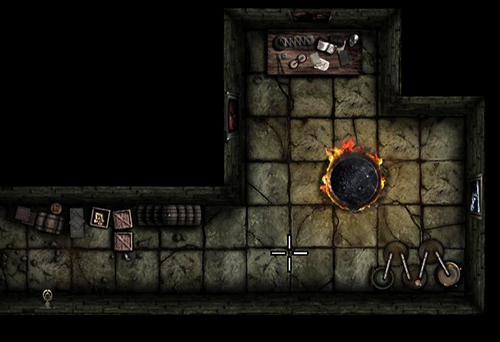 As the adventure progresses, the DM can move the view through the top-down maps with walls and doors blocking views to other, unexplored rooms. Check out a preview map HERE. The arrow keys move you through the dungeon, white lines are doors. Salt halls map here, and an Inn for preview. Maps will be able to be shared publicly, or privately through the site. It’s simple, smooth, and I find it inspiring. I don’t necessarily want a million features, I want the map to supplement my adventure. I DON’T want my adventure to deteriorate into an elaborate tabletop video game. Which is what I think Virtual Table Top may be approaching. I’m glad I asked! For me, this may mean simply having a monitor near the table to display the map. Possibly a tablet at conventions. It MAY result in my AAXA PICO projector being mounted over the gaming table to project ONTO the dry erase board!… ok it will. If this project is a success, it will change how I look at my Drivethru RPG adventures. It would be a slick addition to the .pdf’s to include a Battlemap explorer link for DMs. I like it because it intends to be used by the gaming community, I think I can figure out how to put it to use immediately to improve my own games, and it isn’t complicated. To get in on this modest goal of $1K, CLICK HERE. The backing levels are a bit awkward. $1, $6, $9, then $100. I have sent a message to Byron asking if there might be some more mid-level backer numbers. Something in the $20-$30 zone. Just by completing the previews, Byron has shown that he can deliver. Heck, if all else fails, the site could function under wordpress even. In my dream world, I would like to see tiles disectable at 45 degree angles at least. I am not sure what Byron has under the hood when you place walls on the map. If they are from point A to B or if they are only in 90 degree lines. I would also like to see a zoom feature. Of course since it is built into HTML5, you can hold CTRL and wheel up/down to zoom in and out in your browser. In my dream world I would also like to see the possibility for a downloaded self contained possibility that wouldn’t require an online connection. But everything, one step at a time. Just at the level which he has it now, I can foresee MANY uses and possibilities. I don’t know him, have never met him, but I like his idea and he has a few bucks from me to make this site come to life so I can improve my gaming table. It’s just the tool I want, simple map presentation without complicated interactions. I think it also approaches an important point for RPG supplement writers, illustrators and producers like myself. What is the point of making awesome, colored, textured maps in your games and modules if the players never see them? My future Kickstarters, modules, and products hopefully will include Battlemap Explorer links.